Handbags, don’t you just love them?! They’re the easiest way to make an outfit look flawless. Since Proenza Schouler’s PS1 appeared EVERYWHERE, satchels of different fabrics, colors, prices, and sizes have been showing up everywhere too. One of my favorite brands is The Cambridge Satchel Company. The British company has been making these 100% leather products since 2008. The simple structure of this satchel is reminiscent of prep school days. 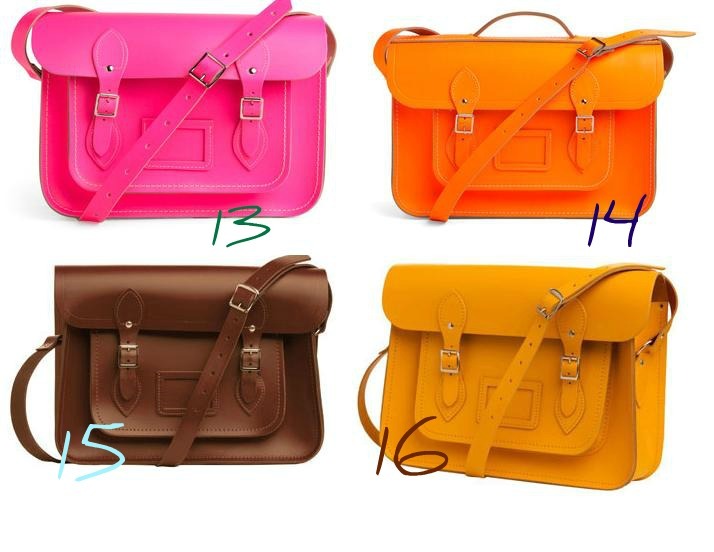 The Cambridge Satchel Company’s mission is to bring the satchel back and it looks like they’re succeeding. 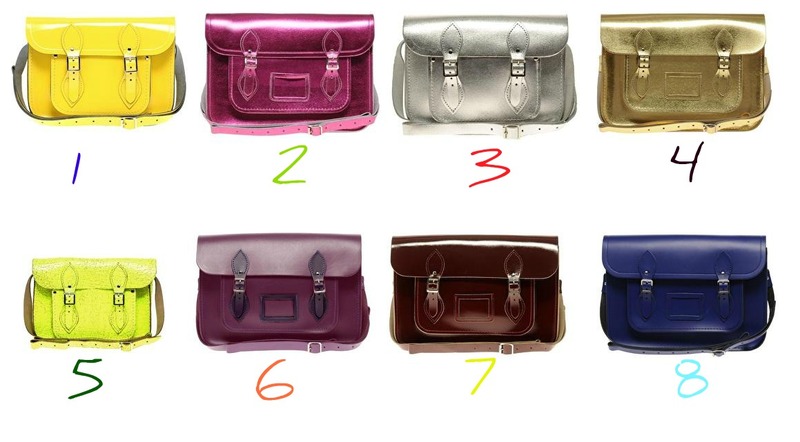 The satchels come in a wide range of colors. Wanna see? Look out below! Yes, they’re slightly expensive yet still affordable compared to other high end satchels. And remember: they’re 100% leather, handmade and awesome. This is what I call an sweet investment piece if it fits into your personal style. Personally I love them and would save up to get one in a color that I can wear often with anything in my closet. So what’s your verdict on this very cool vintage inspired piece? Comment down below! Tags: Fashion, handbags, neon handbags, Proenza Schouler, satchels, style, The Cambridge Satchel Company. Bookmark the permalink. Previous post ← Fringe it up! I double dare ya. I love no.17. I’ll check this out! Thanks for dropping by my blog and for the bday greetings! You’re welcome D.G.! Thanks for commenting!